On Saturday 17th November, Rews will be performing at The Flapper – rounding off their selected UK tour at Birmingham’s iconic live music venue. Doors open at 7pm, with tickets priced at £10 (+bf) – available from Friday 31st August. For direct event information, including full tour details and links to online ticket sales, click here. There are certain press release that raise a smile at Birmingham Review. True, lots of them have the words ‘free’ and ‘bar’ in them, but the one that landed on our desk a few days ago was even better than bourbon for gratis. If such a thing were possible (it is, just). Rews are coming back to Birmingham, playing at The Flapper on Saturday 17th November. And with only 38 days after this gig until The Big Day we feel the expression ‘Christmas come early’ is entirely justified. If you don’t know who Rews are… a sharp intake of breath… they’re a high octane ‘rock powerhouse’ that have drawn comparisons to Royal Blood (but with better melodies). Made up of Shanua Tohill (guitar vocals) and Collette Williams (percussion, vocals) Rews were the first UK signing on Marshall Records – coming out punching from the legendary rock brand’s corner with their debut album, Pyro, in November 2017. A string of singles, tours, and festival appearances followed Rews’ extremely confident debut, gathering some well deserved attention from the rock focused media and then pretty much every pundit with a brain at the BBC (including Mark Radcliffe, who cited Rews as one of his highlights from Glastonbury 2017). To read our Birmingham Review of Pyro, click here. One eight planet dance later and Rews are back in Birmingham, rounding off a five date UK tour at The Flapper – the venue where Birmingham Review first saw them back in February ’17. And it is live that you really want to experience this band, with a ferocious energy and endearing candour flooding off stage every time we’ve shared a room them – click here to read our Birmingham Review of Rews at The Flapper, at the Actress & Bishop, and at the Hare & Hounds. But things got better and better as we scrolled down the aforementioned press release, because there’s a new single on the table too – ‘Can You Feel It?’ will be released by Rews on 21st September, through Marshall Records. An absolute blinder, this is has been one of our favourite tracks from Rews since we first heard it, with the soon to be set free single getting added production value from Romesh Dodangoda (Bring Me the Horizon, Don Broco, Lower Than Atlantis). We’ve had a sneak peak of the new ‘Can You Feel It?’ too and it’s PROPER AWESOME. Seriously, just wait – as soon as we can share something we will. But in the interim you can keep yourself happy/distracted with the last two singles to come from Rews – check out ‘Your Tears’ and ‘Shine’ below. 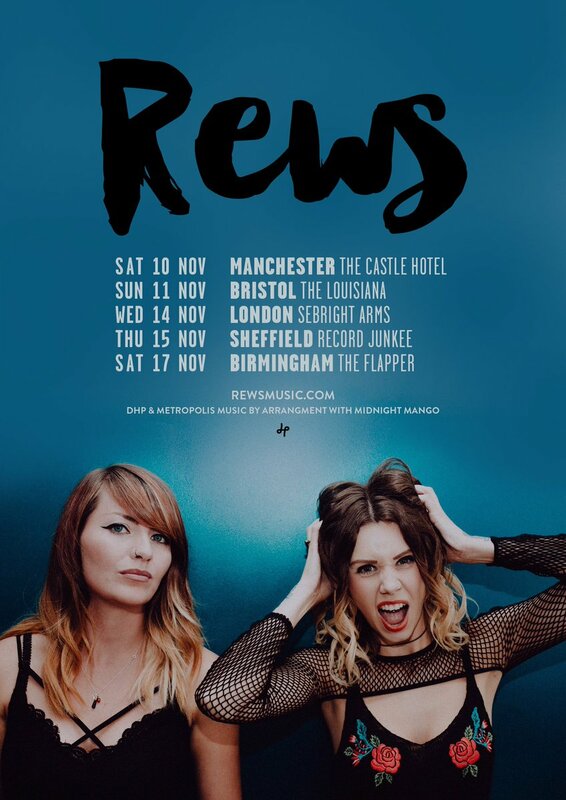 Rews come to The Flapper in Birmingham on Saturday 17th November – as presented by Metropolis Music/Live Nation, in association with Birmingham Review. For direct gig information, including full tour details and links to online ticket sales, click here.